If clouds perfectly reflect the upcoming weather condition, then what do stratocumulus clouds tell about the weather? Understanding its characteristics and features will help you prepare for the kind of weather it brings. Stratocumulus clouds refer to low-lying puffy cloud formations that appear as wide horizontal cloud layers with curved summits. They are the most common form of clouds that indicate the presence of moisture in the lower cloud level. It develops due to the rise of large amounts of moisture followed by condensation at the lower cloud level. Stratocumulus is a sign of gusty weather due to an advancing storm. This cloud may bring only mild precipitation. At What Height is Stratocumulus Clouds Found? Stratocumulus clouds belong to the group of low level clouds, therefore, they can be found anywhere between 2,000 feet and 6,500 feet above the Earth’s surface. Stratocumulus clouds are generally made up of water droplets or ice crystals under sub-zero temperature. Although these clouds produce little to no precipitation, they can have moderate to strong winds depending on the frontal system in which these clouds develop. How do Stratocumulus Clouds Form? The Stratocumulus forms when a large amount of moisture is lifted into the atmosphere and condenses. This rise is either due to an approaching frontal system or landmass which make the cloud layer unstable. So when the rising moisture condenses, the atmospheric instability causes the cumuliform-shape of stratocumulus. Stratocumulus clouds may also form due to weak convection, or rise and fall of air currents, which causes the rising parcels of warm and moist air to condense at the same cloud level and cover a wide area. What do Stratocumulus Clouds Look Like? These clouds closely resemble cumulus clouds except that they are bigger and lumped together. The upper surface of stratocumulus is ragged which is a sign of convection within the cloud level. The base, on the other hand, is well-defined and flat. Furthermore, stratocumulus may develop thin cloud layers that cover hundreds of miles wide. Depending on the thickness of the cloud deck and light conditions, stratocumulus may exhibit light to dark gray hues. In general, stratocumulus clouds appear like cotton balls floating in the sky. These clouds may come in several forms and patterns, thus, they are classified according to shape and coverage in the sky. The two main varieties of stratocumulus are cumuliformis and undulatus; each variety has its own sub-type. This cloud variety of stratocumulus exhibits cumulus-like appearance due to its apparent vertical growth. When stratocumulus clouds display sac-like projections below the cloud cover, they take the form of stratocumulus mammatus. This form of stratocumulus has distinct, bulging, tower-like projections. It may closely resemble a cumulus castellanus but stratocumulus castellanus has defined cloud layers. Under favorable conditions, this cloud form may further develop into cumulus congestus or cumulonimbus. This cloud is generated from a cumulus cloud that had been messed up by a descending convection. 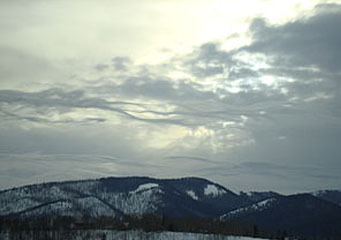 Stratocumulus diurnalis clouds look like long sheets or group of secluded lengthened waves or rolls of clouds. Stratocumulus Vesperalis is elongated and flat which forms at night when the updraft due to convection decreases, hence, making the cumulus cloud spread out horizontally. This variety of stratocumulus exhibits wave-like appearance without major vertical growth. Stratocumulus Translucidus consists of secluded bands of stratocumulus clouds with higher clouds seen between them. This is the complete opposite of stratocumulus translucidus as it is made up of dark cloud layers spreading across the sky without any spaces. The base of the cloud is still visible though because the sheets are incompletely uniform. Stratocumulus of this type takes the form of seed-shaped, elongated and flat cloud which is common in the polar region or the tropical regions during winter time. Stratocumulus lenticularis has clearly-defined edges. This form of stratocumulus has small spaces in uneven pattern, allowing us the see the clouds above it. Aside from the above mentioned varieties, stratocumulus may also come in the form of stratiformis (with stretched out horizontal strips or fields), radiatus (with parallel strips and bands), lacunosus (looks like honeycomb), duplicatus (multiple cloud layers on top of each other), praecipitatio (with precipitation) and virga (with falling strips). How common are Stratocumulus Clouds? These clouds are very common across the globe. During winter, stratocumulus clouds create overcast skies which may last for several days. These tend to disperse during summer due to intense heat. Although stratocumulus clouds never bring heavy rainfall, it may be a sign of an advancing storm, gusty winds or thunderheads.